Bedside lighting is an essential part of any well-lit bedroom; it provides both practical illumination and decoration. On an evening, bright lighting directly above the bed is often too harsh for a relaxing bedtime ambiance. Instead, bedside lighting at eye level will add a warm glow to help you unwind and get ready to snooze. Bedside lamps are also a great source of task lighting for the bedroom. They provide just enough light for bedtime reading and allow you to get into bed without stumbling around in the dark. If you want to create a luxurious and stylish look in your master bedroom, bedside lighting is a simple way to do it. Find out more about bedside lighting ideas with our handy buying guide. One of the most effective ways to add task lighting to the bedroom is with bedside lamps. Lamps are available in a wide range of styles and are an easy way to illuminate your bedroom. Place them on a bedside cabinet or table on either side of the bed for a beautifully balanced look. Decorative table lamps will add a stylish touch to your bedroom. A pair of beautiful bedside lamps such as the Nivian Glass Table Lamp (above) will frame the bed on each side and will bring together the whole room. For bed time reading, a practical bedside lamp with an adjustable spotlight is a great choice. The Philips Eyecare Task Lamp features a sleek white design with an adjustable head that provides optimal light output. Bedside task lamps can be angled to direct light where you need it, perfect for when you want to curl up in bed with a good novel. Look for lamps with an inline switch, which allows you to turn off the lamp without getting up. For a stylish, hotel-inspired look, think about adding bedside wall lights to your bedroom. Available in a wide range of styles, wall mounted bedside lamps are a great way to achieve stylish bedside lighting in any room, but especially where space is limited. 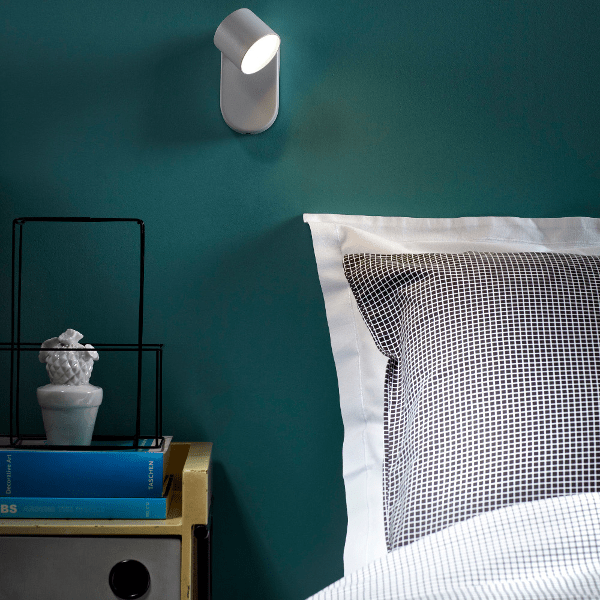 Wall lights don’t require bedside tables – they simply attach to the wall next to the bed. An uplighter wall light will provide soft lighting that is diffused around the room for an overall, relaxing glow. For reading, consider a wall light with a swing arm such as the Junius Swing Arm Wall Light or an adjustable spotlight such as the Philips Star Single LED Spotlight (above). These types of wall lights are perfect for focused task lighting. Place them at eye level on either side of the bed for the most comfortable light output. Look for wall lights with a pull cord switch such as the Sammi 2 Light Wall Light. A pull switch will make it easier to turn off the light from the comfort of your bed. Bedside lighting is especially important for children’s rooms. 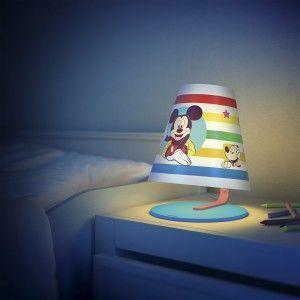 A bedside lamp will provide gentle illumination for story time and can be used as a comforting night light. Children often need a light source to be able to sleep. Choose a bedside wall light or a table top lamp to light up your child’s room at bedtime. Night lights are available in a range of fun and colourful designs, featuring your kids favourite cartoon characters, such as the Mickey Mouse LED Table Lamp (above) or the Disney Princess LED Wall Light. Look for bedside lamps with cool features such as the Spiderman Projector Table Lamp which displays colourful scenes on the ceiling, or the amazing colour changing Philips Cars LivingColours Bedside Lamp. With these amazing bedside lights, children will love bedtime! All of our kid’s bedside lamps and wall lights are safe for children. When choosing bedside lighting, style is an important factor. Think about how a bedside light will fit with the look of your bedroom. Remember that lamps are not only practical light fittings but decorative objects too. To find your perfect bedside lamp or wall light, consider your style and decor. Does your bedroom have a modern or contemporary look? Do you prefer bright colours or muted tones? For a modern bedroom, look for sleek contemporary bedside lighting in chrome or glass. Patterned fabric shades and antique brass finishes will add a more traditional, vintage-inspired look to your bedside lighting. Bedside lights should complement your overall bedroom look and blend seamlessly with your existing decor. 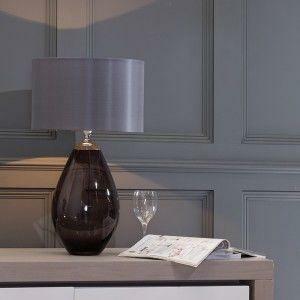 Your perfect bedside table lamp or wall light should be in proportion with the rest of your room and bedroom furniture. Large, spacious bedrooms will look great with elaborate wall lights and grand statement lamps such as the Devon Glass Ball Table Lamp. However, small bedrooms with limited space are better suited to more compact designs like the Octi 3 Light Table Lamp. When you’re placing bedside lamps on a table or cabinet by the side of your bed, make sure that the lamp isn’t any wider than the top of the table. A lamp shade that’s too wide will look out of proportion and can be easily knocked over every time you get in or out of bed. If your bedside table is home to alarm clocks, electronic devices and other bits and bobs, choose a slimline table lamp that leaves plenty of room for other things. Think carefully about where to position your bedside lamps and wall lights. Matching lamps or wall lights on either side of a double bed will add a sophisticated look that will also balance the room and make the bed a focal point. Consider the height of the lamp or wall light in relation to your bed. Lamps should be positioned so that the bottom of the lamp is at eye level when you’re sitting in bed. This means that the light shines on your lap or your book, rather than in your eyes. Finally, you need to add light bulbs to your bedside lighting. For an energy saving option, why not choose LED bulbs? LED bulbs provide a long lasting and energy efficient glow in the bedroom. You can find a huge array of energy efficient and eco friendly LED bulbs here. Bedside lighting should be cosy and relaxing, so make sure that you choose light bulbs with a warm white light instead of a cool white light. Or why not choose yellow light bulbs for the bedroom? Studies have shown that yellow light helps us to relax and feel sleepy before bedtime. Add yellow light bulbs, otherwise known as warm white to your bedside lights for a great nights sleep. If you’re looking for stylish bedside lighting for your bedroom, look no further. Litecraft stock a wide range of amazing bedside lamps and wall lamps online.